Ways to import PDF to iPhone are a Sunday-school truth. If you do a search, you will be informed of dizzy PDF file transfer solutions. For instance, you can rely on iTunes to add PDF to iPhone iBooks, save PDF to iPhone 7 from your computer by emailing or USB, copy PDF documents in iBook on iPhone with iCloud Drive... But the truly satisfactory and easy one is rare, especially when it comes to the non-techy users. No need to google anymore. This page shares the most efficient tutorial to transfer PDF to iPhone iBook with MacX MediaTrans, along with the side by side comparison of the top 3 often mentioned PDF syncing tasks. 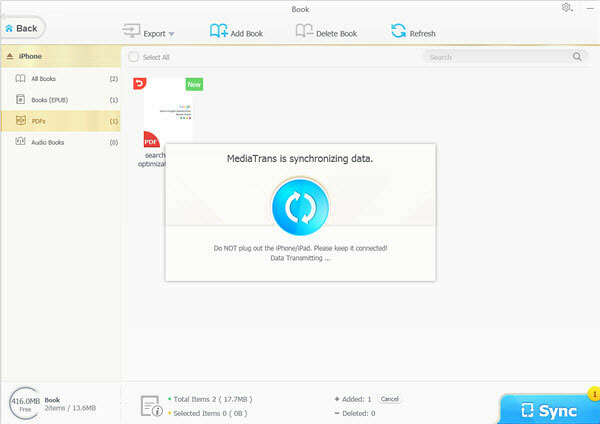 Just click Add and Sync buttons, your PDF files can be transferred to iBooks on your iPhone iPad or iPod Touch quickly with MacX MediaTrans. Add Epub or Audiobooks to iPhone and sync photos, videos, ringtones, iTunes movies, music, etc between computer and iPhone, regardless of the DRM. iTunes, iCloud and Email are the 3 most frequently mentioned solutions to copy and move PDFs to iBooks on iPhone iPad. But this doesn't mean a 100% successful or errorless PDF transferring from computer to iPhone. Below are detailed tutorials and related problems. 2. Click Books under Settings. 4. Make sure there's a check in the checkbox next to the PDF you want to sync, if you only want to add selected books to iBook. 1. Too many pop-up windows increase the risk of wrong selection and lead to failure or data loss. 2. It's complicated that lead to failure the first time, especially for the non-experts. 3. No reverse sync, e.g. you cannot export PDF files from iPhone to computer. 1. Go to iCloud Drive and open it. 2. Drag the PDF file into the drop zone. 3. Go to iCloud on your iPhone to enable it. 4. Launch iCloud and open the PDF with iBooks app you want to save to iPhone. 5. Tap the Download icon in the upper-right corner of the item and download PDF on iPhone from iCloud. 1. You have no access to the PDF files on iPhone unless you have internet connection. 2. You have to pay $0.99 a month for your iCloud storage if you want more GB. 3. The large PDF files are transferring really slowly. 1. Login to your Email account on your computer. 2. Create a new email linked with your iPhone. 3. Attach the PDF files from your computer as an email attachment and send it to yourself. 4. Click Mail on your iPhone > Tap on the PDF files and open it on your iPhone. 5. Click the up arrow button at the bottom Menu once the PDF is open. 6. Choose Copy to iBooks to save PDF to iPhone from the sharing Menu. Then the PDF files will be added to your iPhone. 1. PDF files in very large size are refused to be sent to iPhone via Email. Attachments larger than 50 are rejected by SSCC's server, for example. 2. It's difficult to handle the PDF attachments for some users with web-based email or email problems. 3. It will take time to upload and download PDF on iPhone. 4. High internet speed is required to transfer PDF files to iPad iPhone properly. If you've downloaded or saved PDF files on a computer and want to send them to your iPhone without any complicated steps, risk of data loss or any other annoying issues, you can transfer PDF to iPhone from computer with MacX MediaTrans. It's professional in iBook iPhone transfer, enabling you to sync and add PDF to iBooks library on iPhone iPad in a much easier way. Batch transferring is supported. You don't need to worry about the file size or internet connection when sending PDF files to iPhone. Plus, you can also export PDF from iPhone to computer to release storage space, transfer Epub books, MP3 audio books, videos, photos, iTunes movies, music, TV shows, ringtones, etc at well. Step 1: Free download and install MacX MediaTrans on Mac (High Sierra included). Windows version is available here. Step 2: Connect your computer to iPhone with a USB cable. iTunes settings are required to stop iTunes erasing your iPhone data. Just follow the pop-up window to prevent iPhone from syncing automatically. Step 3: Click Book on the main interface to initiate the iBooks manager. Step 4: Tap Add Book and select the PDF files to be synced to iPhone iBooks. Step 5: Click Sync button to start sending PDF files to iPhone. After a while, you will find the PDF files on the iBook of your iPhone and you open them to view. Note: You can also use your iPhone as a USB drive since this iPhone manager works as an iPhone mounter that allows you to save all your files, incl. PDF, DMG, exel, etc on your iPhone privately. Free download the solid iPhone transfer and manager - MacX MediaTrans to easily and quickly copy and move PDF documents from computer to iPhone for easy access without iTunes sync. Batch PDF sync and no size limit.